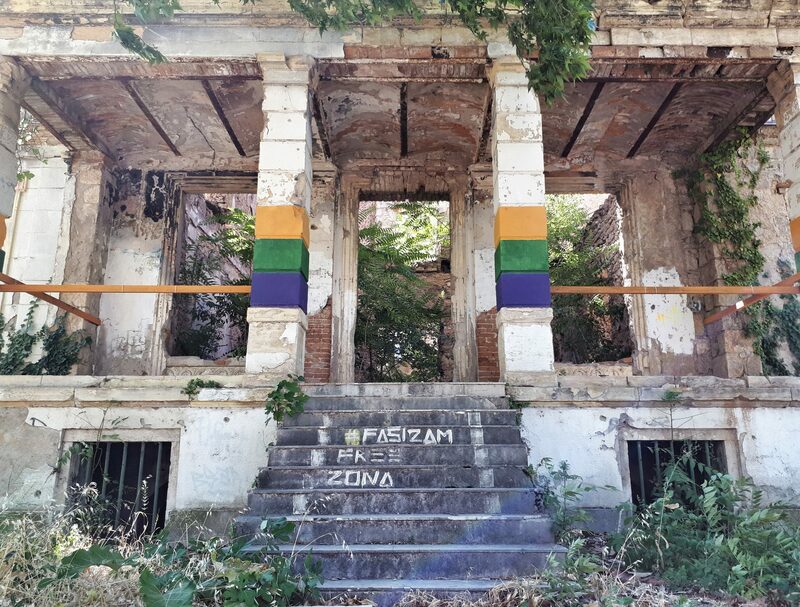 Two decades after the war, what is Bosnia and Herzegovina like today? The Neretva River begins in the Dinaric Alps and flows, beautifully, through Mostar toward the sea. But that’s not why it’s worth a visit. 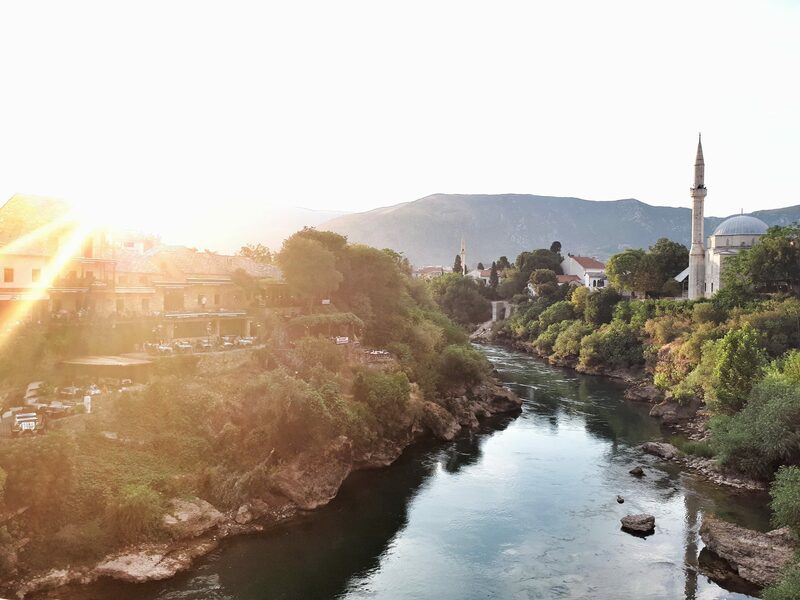 There’s much more to Mostar than the scenery, and it’s only possible to discover the rest of the story if you make the trip. For example: Everywhere there are remains of bullet-pocked buildings, abandoned since the Bosnian Wars of the early 1990s. Weeds grow abundantly through cracks in the sidewalks, and garbage is strewn everywhere. What once was parkland is now filled to overflowing with tombstones made necessary by the Bosnian War. Even the river, which looks stunning from afar, is, in places, littered with plastic detritus and broken glass. All along the river, there are wide-open and eerily empty vantage points for taking in the gorgeous scenery — here an abandoned building slab, there a rocky outcropping that serves as an occasional garbage dump. 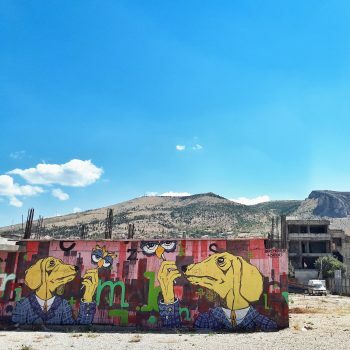 Stark, half-finished buildings and empty, bombed-out ones abound, but residents have beautified these spaces with an incredible array of urban artworks. And, perhaps best of all, the people are wonderfully kind and generous, eager to show you around and share with you their love for city and country. The Neretva River begins high in the Dinaric Alps, flowing 143 miles (230 kilometers) through Bosnia and Herzegovina and into Croatia before emptying into the Adriatic Sea, opposite the southeastern coast of Italy. For some of that distance, the river is flanked by the tracks of the recently re-opened train from Sarajevo, which passes through innumerable tunnels as it wends twice daily through the craggy peaks to and from Čapljina. 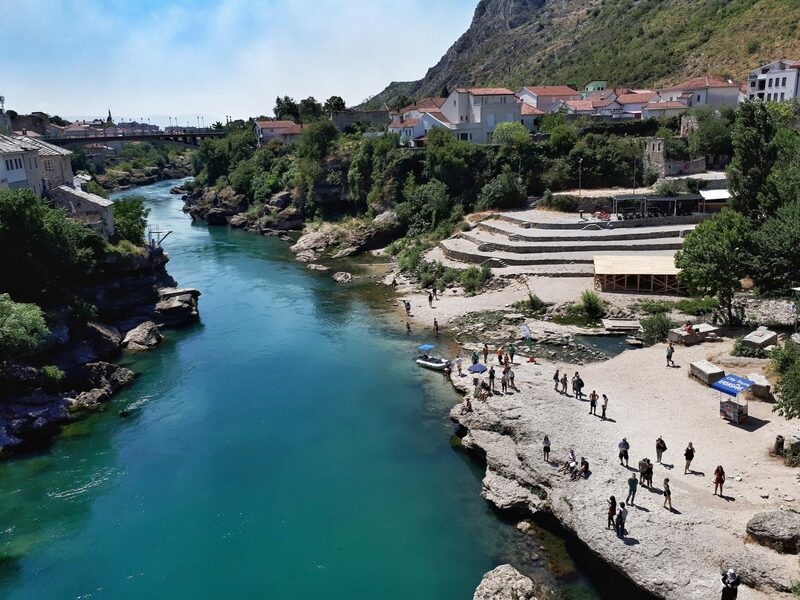 Two thirds of the way south along that train route from Sarajevo, the gorgeous city of Mostar straddles the Neretva River. 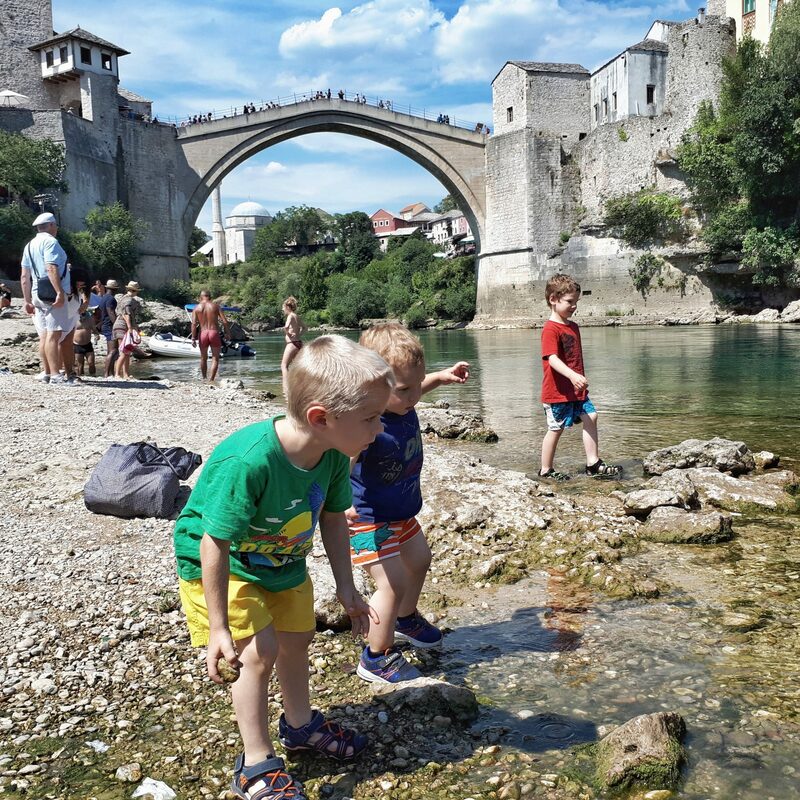 A handful of bridges — including the famous, high-arching Stari Most — provide pedestrian and vehicle access to both halves of the city. A handful of bridges — including the famous, high-arching Stari Most — provide pedestrian and vehicle access to both halves of the city. Our trip takes place in mid July, with temperatures in the mid-90s nurturing several wildfires in the rocky hills that loom over the town. 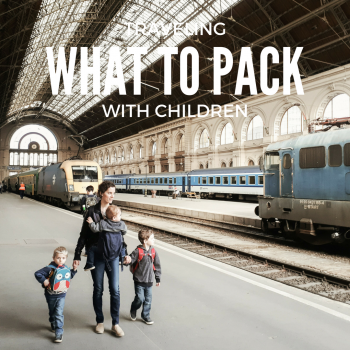 To get to Mostar, we fly from Budapest to Sarajevo, then walk from the airport to a grocery store for diapers and dinner before hopping aboard a bus that we hope will take us to near Sarajevo’s train station. On the bus, a kind woman who speaks a little English takes pity on our tired, sweaty clan and offers to guide us to the station. She tells us where to get off and then walks with us, hand-in-hand with our boys, for about 15 minutes to the station. We’d heard before arriving in Sarajevo that Bosnians are extremely welcoming, and she proves this immediately. At the station, we buy five tickets (two full fares and three inexpensive reservations for the boys) for the 14:26 train to Mostar. Then we buy ice cream cones (as in Budapest, it’s what one does in Sarajevo, apparently) and find a shady spot to wait until the train departs. Surveying the ice cream flavors, we discover, to our delight, some words we recognize. And lo and behold, it’s our limited Hungarian knowledge that serves us here. Stuck among the frosty tubs are tags proclaiming flavors like malina (similar to Hungary’s málna, or raspberry) and narandžasto (narancs, or orange). Later we see other words such as cipela (cipő, or shoe), papuče (papucs, or slipper), šetalište (sétány, or promenade) and ulica (utca, or street). 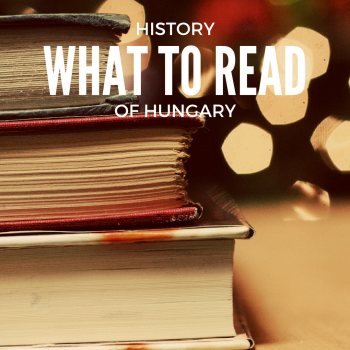 We feel a renewed sense of purpose for our feeble attempts at learning the Hungarian language. On the train, recently reopened after three years of inactivity, the carriages are full. We settle into our seats for the two-hour ride to Mostar, hoping to catch glimpses of the famously beautiful route. We fret a little about being on the right side of the train to catch the best views, but in the end it doesn’t matter. Both proffer lovely vistas of deep gorges, wild rivers and cute hamlets all along the route. In Mostar, we’re greeted at the station by the friendly owner of our hotel, who tells us on the short drive (it’s a small city, after all) that the hotel (pansion, it’s called in Bosnian, which translates to “boarding house”) has been in the family for four generations. He currently runs the hotel with the help of his parents and sister. As he shows us our room, his mother — who also makes ice cream and stocks the communal freezer with it — arrives with four tall glasses of sugary lime juice. The boys, avid drinkers of water, juice, pretty much anything and everything, guzzle it down. I do, too; it tastes amazing. Old Town Mostar is a lovely collection of old stone buildings standing cheek and jowl with (and often on top of) each other. 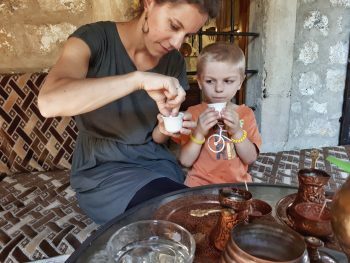 In Mostar, we enjoyed sampling Bosnian coffee as it’s traditionally prepared: thick, dark and with a chunk of sugar for dipping. The coffee tastes a lot like Turkish coffee, actually, and I’m sure that’s no accident, given the broad Ottoman influence in this part of the world. 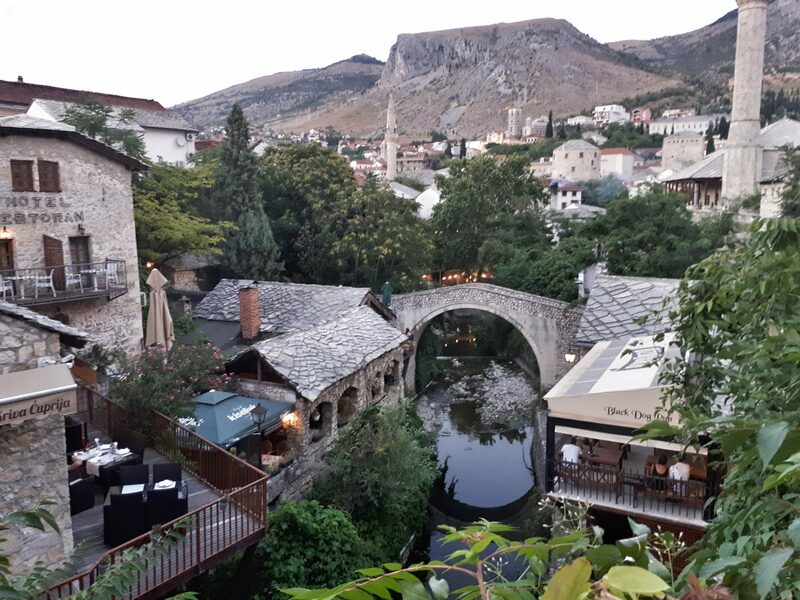 The hotel is situated in the heart of Old Town (“old” meaning the 15th and 16th centuries, way back in the Middle Ages), just above the river and around the corner from the Old Bridge, as the Stari Most is called in English. Mostar, incidentally, is named after the mostari, the men in the Middle Ages who were responsible for protecting the then-not-yet-old bridge from attack. According to story, one side of town was populated by Christians, and the other side by Muslims. The bridge, commissioned by Sultan Suleiman the Magnificent in 1557, symbolized the connection of East and West. Until the Bosnian war, Mostar (Sarajevo too, for that matter) was a paragon of tolerance; people with vast religious and ethnic differences lived together in peace. Two decades after the war, that spirit has largely returned. If you don’t have a car, there’s really no better way to get around Mostar than by walking. As it’s a lovely city, it’s well worth it. We all walked 20,000 steps (roughly 10 miles, or 17 kilometers) per day for the four days we spent in the city. Truly, Mostar is stunning. Its stone-walled, slate-roofed houses practically tumble over each other, separated occasionally by quirky pedestrian paths (paved with smooth, well-worn river rocks that I imagine are deathly slippery in rain). In our minds, the city evokes comparisons to Venice, but without the Disneyland vibe that cheapens some of the Italian city’s appeal. 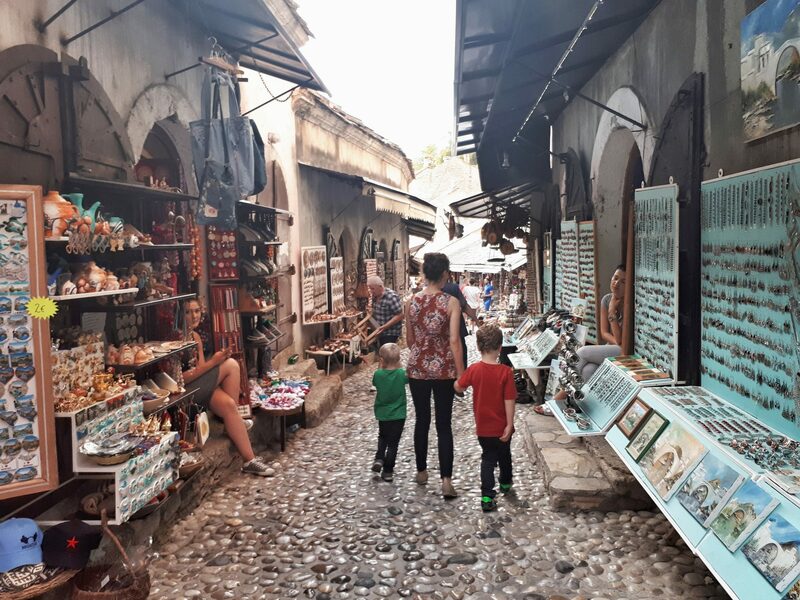 While there are plenty of tourists in Mostar, too, the city doesn’t feel quite like it’s been made into a living amusement park. Mostar is a stunning city. Its stone-walled, slate-roofed houses practically tumble over each other, separated occasionally by quirky pedestrian paths (paved with smooth, well-worn river rocks that I imagine are deathly slippery in rain). 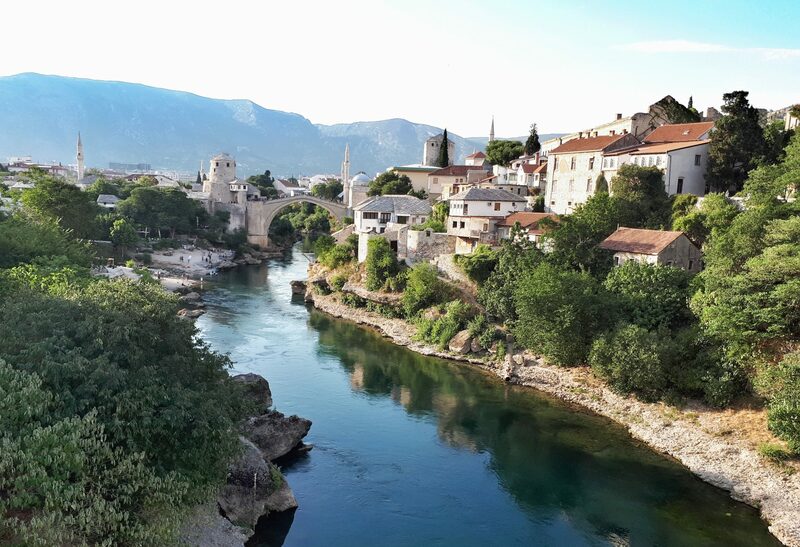 Mostar is built into a river valley, with mountains rising high on both sides of town; no matter when you look, the view is beautiful. Numerous bridges span the river, and each of them affords expansive views of the river and the white-walled houses that crowd its banks. The view from Stari Most. The pansion in which we stayed was just off to the right, within view of the river. It’s called Pansion Nur, if you want to check it out when you’re in Mostar. Those views are also likely to bring to mind the long civil war that gripped this country in the 1990s. Bombed-out and bullet-pocked buildings are extant reminders of the city’s not-too-distant past, which saw the city under siege for three months in 1992 and then for nearly a year in 1993 and 1994. According to some accounts, Mostar was the most heavily destroyed city in Bosnia and Herzegovina during the war. More than 2,000 people died during the sieges, and numerous buildings and bridges — including the 16th-century Ottoman-built Stari Most, which has since been reconstructed — were destroyed. Bombed-out and bullet-pocked buildings are extant reminders of the city’s not-too-distant past, which saw the city under siege for three months in 1992 and then for nearly a year in 1993 and 1994. According to some accounts, Mostar was the most heavily destroyed city in Bosnia and Herzegovina during the war. Life goes on; patch the damage. 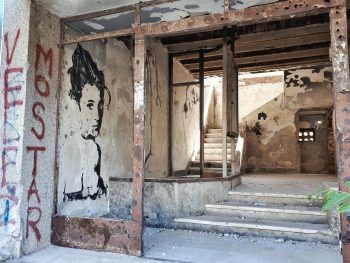 Residents of Mostar have reclaimed many of the old, bombed-out buildings by covering them with beautiful street art. Check out our gallery of Mostar’s urban art here. In Mostar, as in Sarajevo and elsewhere in the former Yugoslavia, thousands of people died during the Bosnian War. Many parks in the city were quickly turned to cemeteries to bury the dead. On one of our walks through town, we stumble across a Mostar cemetery, which appears to be in a former park, in which every single gravestone reads 1992. A number of other graveyards are of slightly older or newer vintage; they are populated whenever there’s a need, and there was a lot of need in the early ’90s. The city is a study in contrasts. One one corner, a crumbling, long-vacant building with a large tree growing through it. Immediately next door, a new, brightly colored apartment building with laundry fluttering from an upstairs balcony. And the sparkling river flows fast, deep and beautifully blue, tainted occasionally by the fetid, murky water sloshing brazenly from open sewer pipes. From a distance, the city is gorgeous; up close, it’s still beautiful but a lot more … real. As the owner of our hotel says, Mostar is not a big city. After four enjoyable days here, we’re ready to explore to the bigger city of Sarajevo for six days before returning by plane to Budapest. We wouldn’t let the boys walk in the river downstream from here, because of the drainage pipe pouring into the water. In style, Sarajevo and Mostar share quite a bit. Almost three times as populous as Mostar, Sarajevo is still a city of middling size, with a population of roughly 275,000. It’s laid out along a river, meaning that it’s long and narrow, boxed in by hills on both sides. During our time here, we end up walking all over the city — up into the hills on both sides and all around from end to end. 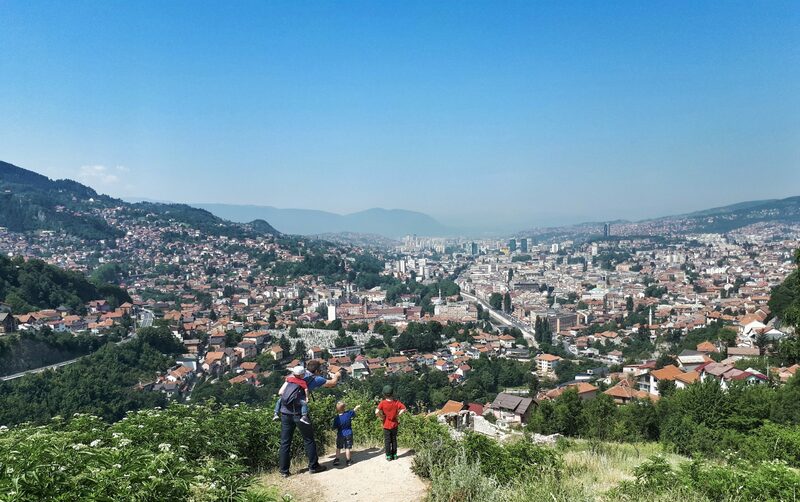 A long, hot walk up to the White Bastion in the hills above Sarajevo rewarded us with stunning views of the city and the country beyond. Our Airbnb place is on the edge of the Old Town, in the heart of Sarajevo. It’s just a block up from the river — which is only a meter-or-so deep where it runs through town, looking more like a drainage canal than a river, but still a lovely focal point for the city. This “Sarajevo Rose” is one of many left throughout the city, serving as a monument to those killed in the Bosnian Wars. In our many walks through town, we come across a number of circular-pattern divots in the ground known as Sarajevo Roses. During the siege of Sarajevo from 1992 to 1996, an estimated average of 300 mortar rounds hit the city every day, creating these patterns in the streets. 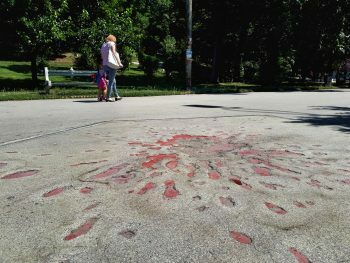 Where people were killed, the marks were filled with red resin as an ongoing memorial. They look a little like red flowers embedded into the pavement, hence the name — Sarajevo Roses. 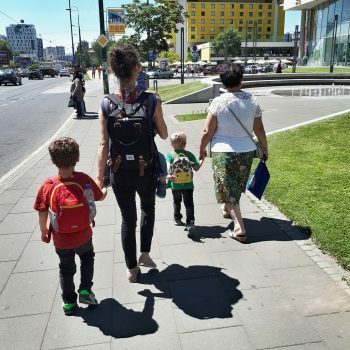 One day, in the 90-plus-degree blazing sun, the five of us hike to one of the highest points in Sarajevo, winding through alleys and side streets at the eastern edge of town. We’re alone when we reach the summit, but a few minutes later some other tourists roll in on taxis and tour buses. They might not be hot and sweaty like we are, but they also haven’t gotten to see the same Sarajevo we have — the one with crowing backyard roosters and smiling old ladies eager to tousle the boys’ hair as we trudge by. Anyway, what a view! As I mentioned, Sarajevo is situated in a river valley, with hills rising on all sides. It truly is a beautiful setting. The hike is hot, without much shade, but once again, the boys are troupers. At the top of the hill, we’re rewarded with incredible views of Sarajevo and an abandoned fortress to explore. We pause to eat lunch before beginning the trek back down the hill. Another place we visit — and probably should have taken a taxi to, actually — is the Tunnel of Hope, a small museum built into a house on the south side of the airport that was, during the siege, one terminus of a tunnel that served as a lifeline for the trapped citizens of Sarajevo. To get there, we take Bus 103 to its very end, and then walk for 45 minutes on streets with no sidewalks (and no shade), winding back and forth across the now-peaceful boundary between the Federation of Bosnia and Herzogovina and Republika Srpska, to get around the airport. The museum itself is interesting, and there’s even a small section of extant tunnel that you can walk through. There’s also a video display of war footage and remnants of tools that people used to survive the war, including a power generator made from an old Fiat engine (and running on fuel that was smuggled through the tunnel). 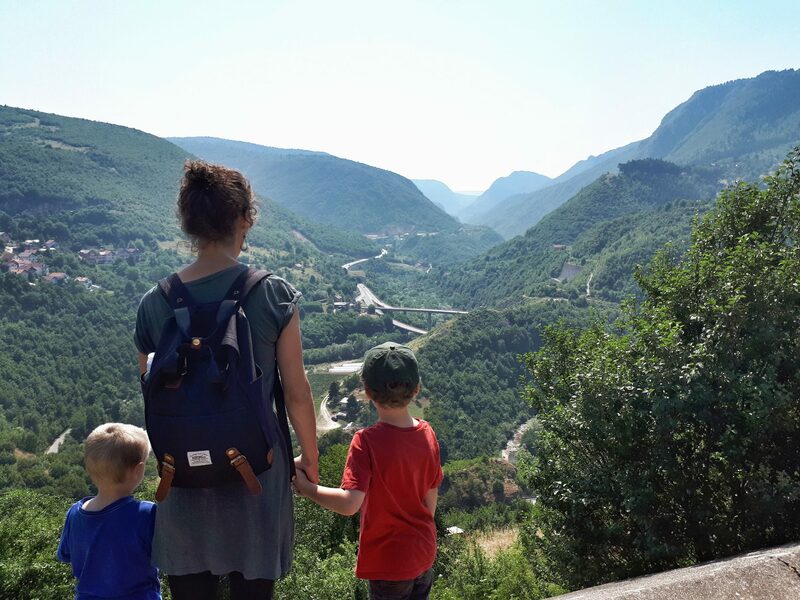 A long, hot walk up to the White Bastion in the hills above Sarajevo rewarded us with stunning views of the city and the country beyond. Looking east outside the city. Despite how it might seem, the city doesn’t feel sad and heavy, as if people think about the war every day. It’s more like they want to make sure it doesn’t happen again. I read a blog post the other day that mentioned that the Sarajevo Roses are slowly disappearing as pavement gets replaced. The post’s writer mentioned that the city, too, seems to be healing as its injuries, literally and metaphorically, slowly disappear. But some of the roses are being preserved indefinitely as a way, I assume, of remembering the past. Cemeteries, too, are part of the landscape here, and certainly they help ensure that residents don’t forget the war. 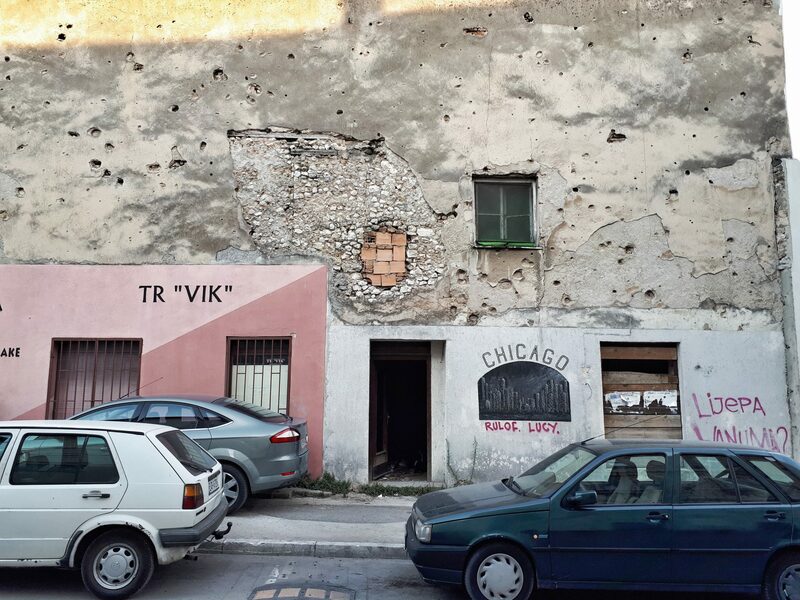 Our visit to Sarajevo lasted only a short time, and though there is undoubtedly much we still don’t understand, we did get the sense that Sarajevo as a city — and Bosnia and Herzegovina as a country, really — is rebuilding. The people are friendly, the landscape is gorgeous, and the city itself, while certainly still bearing the scars of what was the longest siege of a capital city in modern warfare, definitely seems to be standing tall. When I’m the US Military I was in both Bosnia and Kosovo in 2000-2001 time frame. Both places utterly destroyed. We even went to an orphanage to volunteer for a day. I’ll never forget that day. Those poor kids, who acted like nothing happened, were so happy to have us there. Being a basketball player my whole life, I was immediately drawn to the orphanage basketball court. I played for hours with the children. I was probably sweating similarly to the way you were during your hike. I try to start each and every day thinking about perspective and many days the first thing that comes to mind are those children I spent just one day with. Unfortunately they will never know the profound impact they have had on me. Thank you for sharing your story and pictures. Matt, thanks so much for sharing your experience! I imagine that that day meant a lot to the children, too, even though they could never tell you. Thank you for your service and for the positive impact you undoubtedly had on those kids that day, just as they had an impact on you.